However, the agenda of the TPP is a securitization of customs and border patrol services, telecommunications, corporate competition policy that directly effects immigration, corporate investments, and the addition of intellectual property rights with focus on copyright limitations. The TPP, held in secret, is in actuality a multi-national trade agreement that seeks to extend intellectual property rights across the globe; creating an international enforcement scheme. 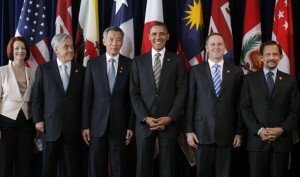 The leaked document drafted as the US TPP Intellectual Property Rights Chapter clearly states that negotiators for Obama are actively pushing for the adaptation of copyright measures that further restrict that is outlined in the Anti-Counterfeiting Trade Agreement (ACTA) and other similar international treaties. There is an initiative to control global IP enforcement by the UN under signatory treaty wherein nations will be mandated to enact domestic laws that have been worded to reflect the provisions in the TPP agreement. As in the Digital Millennium Copyright Act of 1998 (DMCA), that places federal agencies in control of digital “locks” and enforcement of over=blown statutory damages on claims of copyright infringement; as well as restricting the US Congress from altering existing IP governances as changes in technology and innovation demands such elasticity. This entry was posted on August 1, 2012 by Amir Alwani. It was filed under economy, NAFTA, news, sovereignty, TPP, tyranny, world government and was tagged with Agenda 21.